Karma is a woman and, she's a real Bit##. 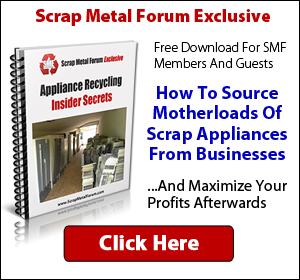 "anyone who thinks scrappin is easy money ain't doin it right!" I'd stay honest. I mean, if you owned the yard, would you want that stuff going on? That just gives certain scrappers a bad name at the yard. I want my yard to know that when I pull it I've got good stuff for them, and I expect to be treated fairly, too. Fairness has to run both directions. I'd almost bet they short his weight when he pulls out by 20-50lbs or so - how would he know unless he goes to a truck weight station to find his weight? They probably laugh at him. It seems that there are those that justify trying to do onto others before they do onto them. Seems it depends on if a person is honest or they just pretend that they are more honest then others as make believe and pretend reality does rule this world. I find it interesting in a sad sort of way how some people are so smart that they outsmart not only some others, but also themselves. Then they get angry and try and feed the anger monkeys on their backs as that makes them feel alive and powerful. I have noticed over the last 30 years that many people that I knew were getting more desperate as the credit trap squeezed them and cut off the air supply to their brains like a nasty tumor. Justification can be bought for a price at the same place that sells magic goo for growing hair on bald heads, invisible friends and all sorts of lucky charms and special chanted words. and as always Wednesday is double coupon day. may the farce be with you? Man these are some horror stories but Im sure there are worse out there. I enjoyed the guy at the scrap yard being able to sit back and relax when I showed up because I had everything sorted and mostly clean. The dirty whatever was in a separate bucket and large appliances where dismantled as much as possible or had a few holes it in. The worst I have knowingly done is put Hershey kisses foil in cans because I hate the trash and my kids leave it all over the place. i can also cheat my yard quite a bit but it just doesn't feel right. any normal, decent person can tell deep down in his heart if something is right or not and im not comfortable about cheating. there have been a few times when i did cheat but that was bcos i saw that the yard unfairly docked/deducted a few kgs from my clean non ferrous ... so i made a point to remedy that. tmrw im taking in another load of non ferrous- almost all clean(dirty is kept separately) & im going to tell the guy BEFORE i put my stuff on the scale that he does not need to deduct bcos my stuff is clean. Did you ever try talk to them about it - or just decided to cheat next time to be "even"? they will just say that i should speak to the guy in charge of the non ferrous next time- and no talk of recompense for the deductions.